Home Editor's Roadside Journal Is this the world’s longest travel trailer? Is this the world’s longest travel trailer? 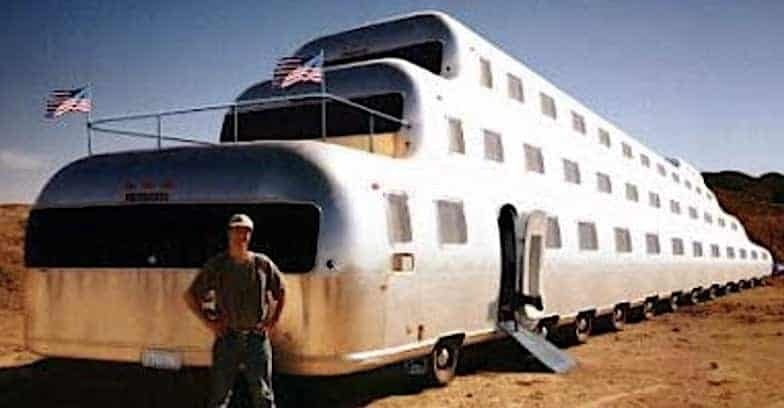 This amazing travel trailer was built by the man posing by it, Albert R. Beglar, in his back yard using surplus airplane wings, a screw driver, staple gun, crescent wrench and Elmer’s glue (pretty much the same way cheap RVs are built). It took Albert and wife, Betty, six years, working 6 hours a day, to complete it. “At first, I was just going to build a 15-foot travel trailer,” said Beglar, who owns a model railroad shop in Wichita Falls, Texas. “But I got carried away and the project took on a life of its own.” He said he needed to weld together 18 bus chassis to support the recreational vehicle. The supersized RV includes 80 bedrooms, 25 bathrooms, a small swimming pool, gourmet kitchen, beauty salon, Subway shop, and a ballroom on a floor atop special air-cushions so it can be used while the large RV is moving. The stage will accommodate a 20-piece orchestra. Okay, everything you read above is a lie. We have no idea who this guy is, and we’d bet big money that this photo is the creation of a pretty darn good Photoshop artist. We could have continued the beginning of this story without saying anything about it being totally made up. If we did, a whole buncha people would have posted it on their Facebook pages, and then it would be shared, and it would go viral, and we’d make $25,000 from advertisers from all the views we’d get. Previous articleWill you celebrate Saint Patrick’s Day? Got me too!!! I couldn’t imagine towing this thing. LOL!!! Every time I go to an RV show in Dallas, the RV’s get taller, wider, longer and heavier. They have a two year warranty and twenty year payment plan. Do you mean I shouldn’t have wired this guy $20,000.00 as a deposit to purchase? The turning radius is measured in parsecs. Sure, but how long does it take to do the Kessel run? I have the DVD box set of all the Star Wars movies, and was thinking of naming my twin boys R2 and D2 when they were born, but my wife overrode me. This would have been a good April Fools Day story! Can I tow this with my ’84 Ranger 4 cylinder, 4 speed? Or should I consider maybe the V6 instead? Is it 30 or 50 Amp? LMAO!